March 02, 2016, 4:29 p.m. It took eight days for Starbucks’ perception levels with its current customers to drop by half, after announcing the overhaul of its loyalty program, which will follow the game plan of most airlines and allocates awards by dollars spent, not by number of visits. The news seems to have dampened purchase consideration among current customers as well, which is an indicator of future revenue. 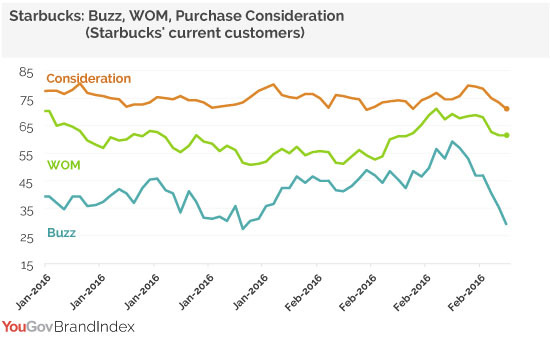 On February 24th, 80% of current Starbucks customers said they would consider making their next purchase at the coffee shop, while now that number has drifted down to 71%. 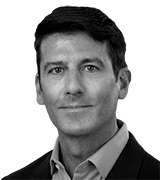 To measure perception, YouGov BrandIndex used its Buzz score, which asks respondents: "If you&apos;ve heard anything about the brand in the last two weeks, through advertising, news or word of mouth, was it positive or negative?" A score can range from 100 to -100 with a zero score equaling a neutral position. On February 22nd, when the announcement was made, Starbucks’ Buzz score with current customers was 60. By Monday, February 29th, the score had dropped to 29.